You might wonder why we'd offer this free Rack Armour installation. The first reason is we want you to see how Rack Armour works without a lot of hassle. In a lot of cases you'd never try this really great product. So, we've set aside a specific number of these to give away to the first people who respond. Ultimately, we'd love you to buy a lot more to fill your building with them, but until you see how effective they are, that decision would never happen. 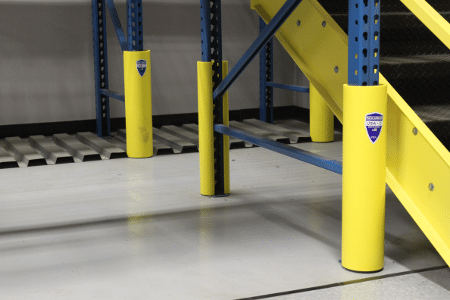 How effective are Rack Armour post protectors? See for yourself by viewing the video below. Thank you for responding to our letter, we appreciate your interest. Fill out the form to receive your FREE RACK ARMOUR SAMPLE. One of our experienced installers will bring a Rack Armour unit to your facility and install the product (no anchoring required) at no cost to you.